Holy Champions ready for battle! New art by Pat Loboyko. 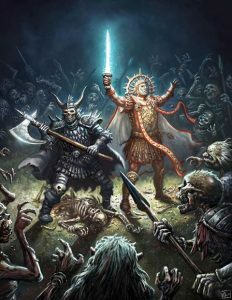 Looks like our Nerothian Holy Champion and his Illiirite priest companion are neck deep in undead. Attention: we are looking for 5e GMs for Origins game fair, we are offering badges of you run enough slots. DM us if interested.